One of the two. Hope you're enjoying the beginning of your work or school or regular old summer week. I sure am, because I can walk again! Just a small limp but ain't nobody gonna hold me down. Ain't nothin' gonna to break my stride. Nobody's gonna slow me down, oh-no. I got to keep on moving. Cannot believe I just quoted that song. Forgive me, it's early here. I'm now back to full time work status which means 5 a.m. every morning. That means I'm up at 4:34. I've timed it perfectly that I can wake up, get dressed, brush my teeth, look somewhat presentable, grab my breakfast lunch from the fridge and be out the door by 4:45. I know, I know. Impressive. It's down to a science. NATURAL LIGHTING FOR YOUR PICTURES!! Tonight, I'm meeting some of my girlfriends for sushi before we all get back into working, going to grad school and moving away (Naomi!). Because I love them so, and because it's always better to share baked goodies than to hoard them up yourself, I wanted to make a treat that we would all love. Yesterday, driving home from a Folk Art Festival in Wilmington, Delaware and a quick visit to the Rut with my parents, my mom just needed ice cream. We drove and drove and drove and honestly no ice cream joints on our side of the road for miles. From Columbia, Maryland all the way to DC...nothing! This ended up like a blessing in disguise, because our route took us right to U Street in DC. Known for some of it's restaurants, I was sure we'd strike gold. And we did! U Scream for Ice Cream was the place. And you want to know something amazing? I actually resisted getting any. (The whole not walking for over a week isn't the most helpful weight control mechanism). Alas, my mom got carrot cake ice cream and my dad got a red velvet flavor. And they truly inspired me. Tonight, I'm going with an all time favorite. I love red velvet, but toting around a cake isn't the easiest option. 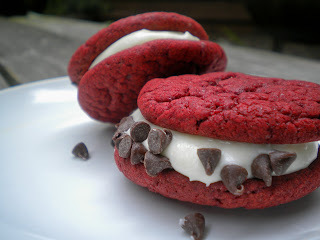 So, for my friends, red velvet cookie sandwiches. Portable, totable red velvet delicacies. They're so cute, no? I thought maybe cupcakes would be a good idea but why not try something new? They taste just like the cake... but with the consistency of a cookie. Do not be tricked; these are not whoopie pies. I don't like whoopie pies. There I said it. 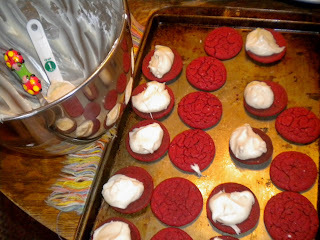 These are wonderful cookies sandwiched with perfect cream cheese frosting. And they were a hit with the girls. I cheated a little. I didn't totally make this from scratch. I made my own frosting though! And you have to admit, they look homemade. And they taste homemade. And they are, who am I kidding! These were great and easy. They could be seasonal, festive, plain or coated with chocolate chips, pecans, you name it. You could probably do this with any cake, so I'm going to continue experimenting. Anyway, here's the recipe! It made 24 mini sandwiches. You could go bigger if you wanted. 2. Mix together cake mix, eggs, and oil into a mixing bowl. I used a table spoon to scoop the dough and then split each ball into two minis. Place 2 inches apart on ungreased baking sheets. These babies expand, so don’t worry about them looking too small. 3. Bake in the preheated oven until the tops start to crack, about 8 minutes. Cool in the pans for 10 minutes before removing to cool completely on a wire rack. 4. In a large bowl combine cream cheese, butter, evaporated milk, and vanilla, Add the confectioners' sugar 1 cup at a time, mixing well with each addition. If consistency is too stiff, add more milk. Try to match same size cookies, if your bad at making uniform size like I am! 5. After cookies to cool. 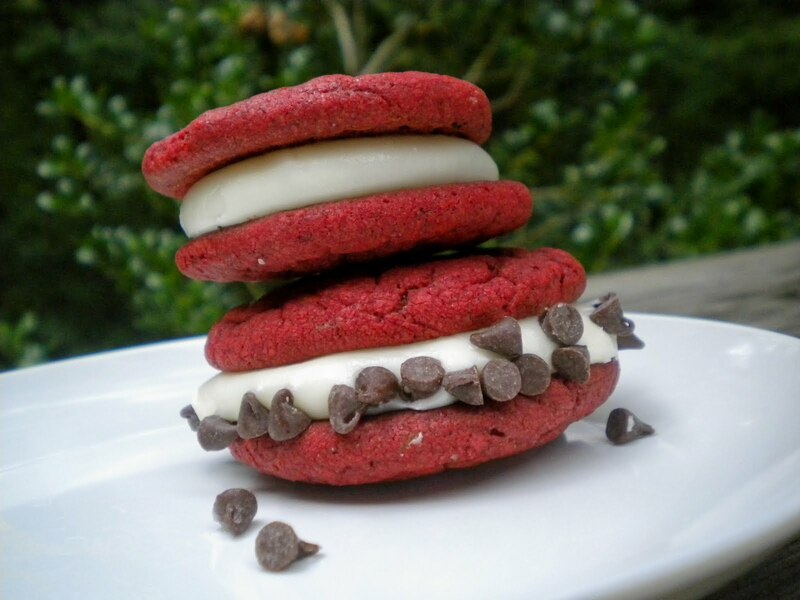 spread a generous amount of icing on the bottom of a cookie, sandwich it with another cookie. If using chocolate chips, press firmly so that the icing comes all the way out to the edge. Roll the edges of the sandwich cookies in the mini chips. I have to say that the title put an image in my head that was not let down by what I saw and read here. Totally cool. I'm ultimately impressed with you being up and out of the house so quickly. I also time things down to the minute... nicely done! You know I love red velvet too! These look wonderful. Wish I could pick up a pack at the supermarket. Better than any oreo. This is pure genius. What an incredible idea and gorgeous little treat. I love your recipe for cream cheese frosting. Those were SO delicious! I didn't know how you were gonna pull it off but you made it happen...I was not happy that I had to share them when I got home! These red velvet cookies look soooo good, and what a brilliant idea! 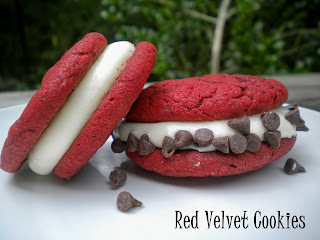 I love red velvet and will definitely try these. When I saw the title of this post on my google reader, I got so excited...and you did not disappoint! 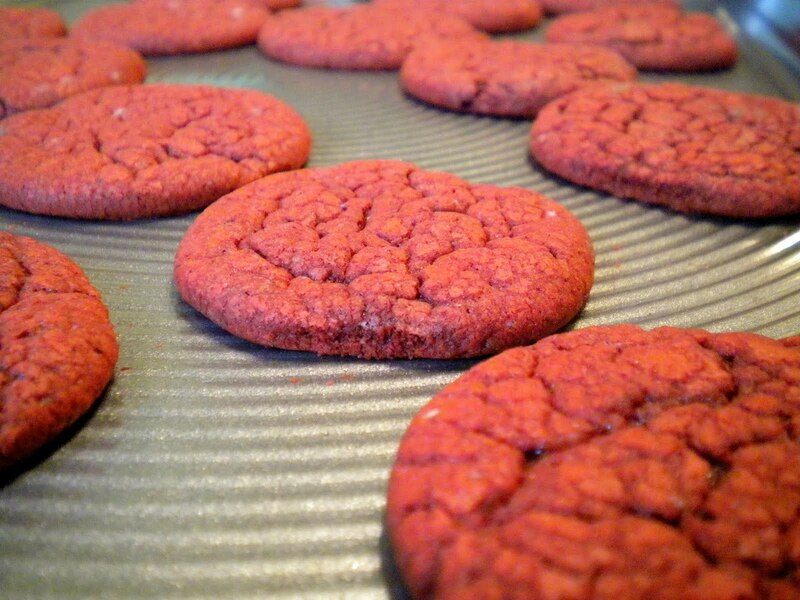 Red Velvet is my favorite cupcake and I can only imagine how much I would enjoy these cookies. I want to give them a try ASAP! anything with homemade frosting is worth eating--you could frost carrots with your frosting and I would happily consume! Oh these look so good! I love the addition of the chocolate chips around the edges too! Do me a favor and next time you go walking would you mind walking as mile for me? Great looking cookies I bet the were scrumptious. Yeah for walking and love the Red Velvet cookie sandwiches. Can't wait to try this. I tried in the fall to do pumpkin ones with a recpie from Rachel Ray but the cake parts were too moist/wet. What a totally clever idea! I will have to give this a try sometime. Looks amazing.